… And the Poop Too! Meet Stanley… …an energetic three-year-old who has not quite mastered using the potty. Stanley is way too busy playing to stop having fun. He would rather hop, skip and wiggle than get the job done. Then Stanley learns a new game called You and Me Against the PEE…and Me and You Against the POOP! Armed with a powerful secret for potty-training success and eager to play, Stanley proudly transforms into a Potty Expert. This fun and colorfully illustrated book will turn all kids into Potty Experts while providing grown-ups with an important reminder that potty learning can and should be a team effort. Written with Julia Cook. This fun, creative book is a must-read for every potty training family! It challenged my 3 1/2 year old to finally take control and become a Potty Expert. By combining the books valuable advice and engaging illustrations with plenty of consistency and praise, we finally conquered this important developmental milestone (accidents not included). This book is cheerful, informative, and developmentally on-target. Friendly and helpful for children and parents alike. 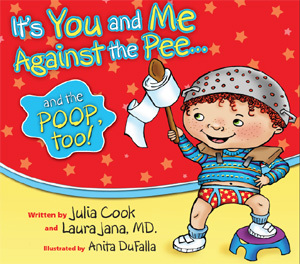 "This fun, creative book is a must-read for every potty training family! It challenged by 3 1/2 year old to finally take control and become a Potty Expert. By combining the book's valuable advice and engaging illustrations with plenty of consistency and praise, we finally conquered this important developmental milestone (accidents not included).